This hat was designed by the milliner Graham Smith for the 1985 Pirelli calendar and features the famous tyre tread pattern of the Pirelli P6 tyre. The calendar was introduced by the Pirelli tyre company in 1964 as a trade publication featuring women in 'glamour' photographs and it quickly became a cult item. Each year the company chooses one of the world's top photographers to shoot the calendar. In 1985 the theme of the calendar was 'Fashion' and photographer Norman Parkinson shot models Iman and Anna Andersen wearing accessories and clothes featuring the tyre tread pattern. Known for his mastery and superb millinery technique, Graham Smith was a fitting choice to create the hats for this Pirelli shoot. Smith studied at Bromley College of Art and the Royal College of Art. At the beginning of the 1960s he moved to Paris to work for the house of Lanvin-Castillo, then later returned to London where he worked for Michael of Carlos Place. In 1967 Smith set up his own business in Mayfair, becoming one of Britain's leading milliners. 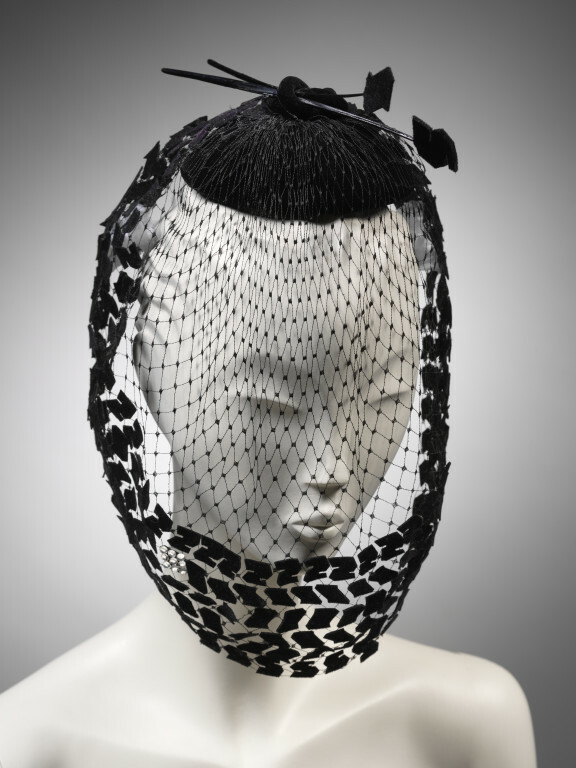 Small black percher hat 'Pirelli Calendar 1985' with a deep snood-style veil in black net with velvet appliqué. With two hat pins. Registered File number 1985/1213. 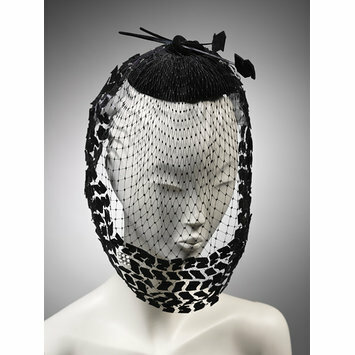 This hat was specially commissioned for the Pirelli calendar 1985 and was photographed by Norman Parkinson. It was featured on the back cover, modelled by Anna Andersen. In 1983 Martyn Walsh the Art Director and Designer of the Pirelli Calendar suggested to Pirelli UK Ltd that they revive the famous Pirelli Calendar and as an innovation incorporate a fashion show using the P6 tyre tread as the decorative theme. Fourteen leading British Designers were invited to make clothes and accessories using the tyre tread design. These commissions represented a significant break-away from the traditional Pirelli Calendars and resulted in an unusual and stylistically powerful collection. The dramatic photographs were taken by Norman Parkinson. At the Calendar launch the collection was auctioned for charity and later the owners generously gave these unique works to the V&A. The Mannequins and display are by the Creative Team of Adel Rootstein Hopkins Ltd. The display will be in the Dress Collection from 5th November 1986 to Autumn 1987. It is divided into two parts, one on either side of the Dress Collection at the entrances from Rooms 21 and 47 respectively.